Sealaska Heritage Institute (SHI) will offer three new scholarships this fall for art and museum studies students enrolled at the University of Alaska Southeast (UAS) and the Institute of American Indian Arts (IAIA) in Santa Fe, New Mexico. Through the program, funded by a grant, SHI will offer $35,250 in scholarships to Alaska Natives in four categories: At least two scholarships will be available to Alaska Natives attending either UAS or IAIA who are pursuing a Northwest Coast (NWC) arts associate degree or studio arts degree; at least two Internships will be available to Alaska Native students attending either UAS or IAIA who are pursuing a NWC art associate degree or studio arts degree and who have at least two years of college experience; at least two scholarships will be available to Alaska Native students attending either UAS or IAIA who are pursuing a museum studies degree; and one museum studies internship is available to Alaska Native students attending IAIA who are pursuing a museum studies degree with concentrations in one or more of the following: collections care, exhibit design, exhibit fabrication and conservation, and who have at least two years of college experience. The program is part of SHI’s goal to support a Northwest Coast arts associate degree or certificate at UAS and a studio arts and museum studies degree at IAIA, said SHI President Rosita Worl. “Our goal is to make Juneau the Northwest Coast art capital of the world, and to do that we need to ensure our current and future generations are learning our ancient art practices and creating pieces that achieve the highest standards set by our ancestors. “We also need more Native people caring for our collections and this program is a way to increase the number of experts in the field,” Worl said. The availability of the scholarships in future years is dependent upon federal funding. More information on how to apply coming soon. Sealaska Heritage in November 2016 entered into a three-way partnership with the IAIA and UAS to provide enhanced and expanded Northwest Coast art programs and opportunities for Alaska students. Santa Fe over nearly one-hundred years has developed the world’s model for advancing Southwest Indian art with the founding of the IAIA and the city’s annual Indian Art Market, which draws more than 100,000 people. SHI has long sought to emulate this model to advance Northwest Coast art and to designate the art form a national treasure. IAIA currently has an average of 10 Alaska Native students enrolled per semester, out of around 475, and the Santa Fe institute is hoping to see that number triple. Currently, UAS offers a certificate in NWC art, and is in the process of developing a two-year degree. Through a plan outlined in the agreement, students who have completed two years of study at UAS may then transfer to IAIA to complete a four-year degree. SHI will work with both educational institutions to provide expertise on NWC art, culture and history. Initiatives include providing visiting artists a working space in the Walter Soboleff Building, developing a Visiting Art Scholars Program for graduate students and researchers, providing access to SHI’s archives and art collections, and seeking guidance from SHI’s Native Artist Committee on the direction and development of arts programming. 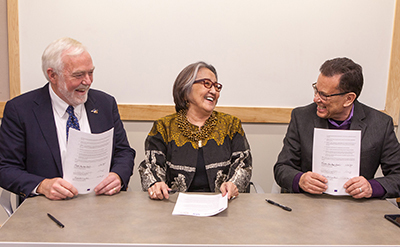 Caption: From left, UAS Chancellor Richard A. Caulfield, SHI President Rosita Worl, and IAIA President Robert Martin in November 2016 signing a memorandum of agreement to provide enhanced and expanded Northwest Coast (NWC) art programs and opportunities for Alaska students.